Finding the a reliable hard wood floor company can be an arduous, and at times overwhelming task. Often, the toughest part is knowing what to look for in an industry which many of us have never used before. What are the hallmarks of a quality wood floor company? Sure, you can look on Google Reviews, Yelp, and even talk to a friend about a hardwood floor repair and installation company that they worked with, and we would certainly say that such a route is a good way to start. But even if your best friend “Todd” had a fantastic experience with his new hardwood floor job, perhaps you are looking for just a hardwood repair, or a different kind of service. Ultimately, there is going to be some level of risk associated with doing business with any flooring contractor, whether they have a stellar online review or not. With that in mind, we decided it would be a good idea to help educate our readers on what makes a hardwood flooring contractor recognizable as having quality. 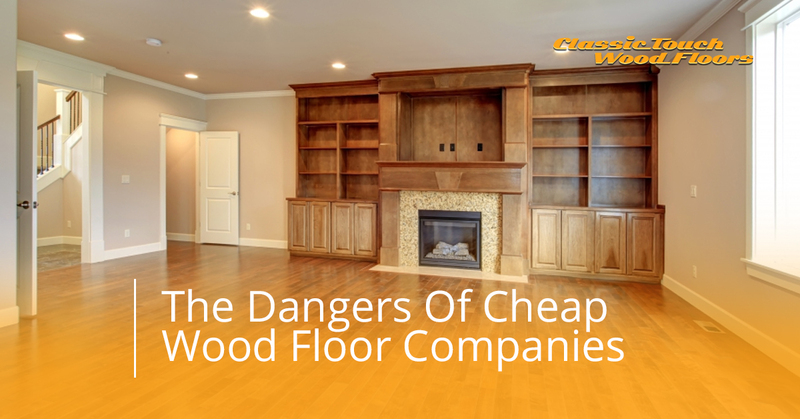 Before that, we will discuss some of the more common pitfalls and dangers associated with doing business with a cheap wood floor company. And even before that, we want our readers to know that here at Classic Touch Wood Floors, you can get a free quote for any work you would like us to do. If you are in Danville, Harrisburg, Williamsport, Bloomsburg, Lewisburg, or really in any part of Central Pennsylvania, we would be happy to answer any questions you might have. But before you do that, we want you to know why we are one of the good guys. So let us prove that to you below. We won’t be talking about any local flooring contractors today, and neither will we address these businesses by name (with the exception of huge brands, because you should be aware about what often happens when going with massive corporations who don’t treat your wood flooring project as special). We aren’t in the business of taking cheap shots at others in our vertical. However, we are in the business of making sure our community members in Pennsylvania are well treated when they receive any work done related to hard wood floors. Let’s look at a few real-life examples, shall we? Bob goes onto talk about how Home Depot ignored his attorney’s letter, the BBBs requests for information. Within the agreement, it is expressly stated that any change in services must be done so in writing. That clearly never happened. Bob goes onto describe that this hard wood floor company admitted they were in the wrong, but failed to do anything about it. That is depressing, and infuriating, if you ask us. A quick look at Consumer Affairs will tell you all you need to know about working with some of the “big boys” in the industry, as they are full of negative experience after negative experience. Don’t believe us? Here is just one more of myriad to choose from. Darren, a contractor who hails from Kansas, has this to say about working with Home Depot. Wise words from a seasoned pro, at least from the sounds of it. Darren goes onto make an important point. He argues that some measure of responsibility must lay at the feet of the customer for being overly trusting and perhaps naive. Most staff members at places like Home Depot are qualified to give you advice about materials, but that doesn’t make them flooring contractors. So, we’ve established it’s difficult to trust certain larger companies to do what they say they will. On the other hand, an alternative is for you to install the wood floor yourself. If you can, go for it. But be advised, it’s a challenge to get the job done well. There is so much that goes into the process, from the prep work of emptying the room, arranging secondary housing while the painting dries, labeling heating registers, clearing nails, learning how to operate a buffer machine (no easy task), renting the equipment, operating a drum sander, applying finish, among many other difficult jobs that require some degree of training, in our estimation. But we would understand if you didn’t want to just take our word for it (we do have a horse in this race, after all), so go ahead and read this New York Times article for the full DIY description, in which the author compares the process to the pain of childbirth. One piece of advice that we would offer our prospective customers, or anyone looking for hardwood flooring installation, is to do your due-diligence on the flooring contractor. Ask for a list of recent jobs that they’ve done, in addition to the typical online reputation detective work that most responsible homeowners will employ. A second piece of advice is get a clear contract that is understandable. Handshake agreements are easier in the moment, but too often can come back and bite you in the rear. Poorly phrased, vague contracts are not much better, either. Here at Classic Touch Wood Floors, we would be happy to talk through our contract with you, in addition to providing you with any information you might request. That is one of the ways we do our best to set ourselves apart from the competition. Not only do we provide free quotes, we do our best to give you the confidence you deserve when making an investment on your home. We will provide a thorough quote, will prepare the subfloor and layout, and remain communicative with you throughout the duration of the project. From start to finish, we will be punctual and behave respectfully when we are guests in your home. We have a passion for providing our community with beautiful, professional, and custom hardwood floors, and would love if you gave us the chance to earn your business. Get your free quote today.